Summary of today’s show: As Massachusetts voters prepare to consider Question 2–a proposal to legalize physician-assisted suicide–in November, Dr. Ken Stevens, an oncologist from Oregon, sits down with Scot Landry to talk about the impact of passage of a similar law in his state in 1994. Since 1998, when the law went into effect, more than 600 people have taken their lives under its provisions, the suicide rate in general has skyrocketed, and patients are being denied treatment by insurance carriers. 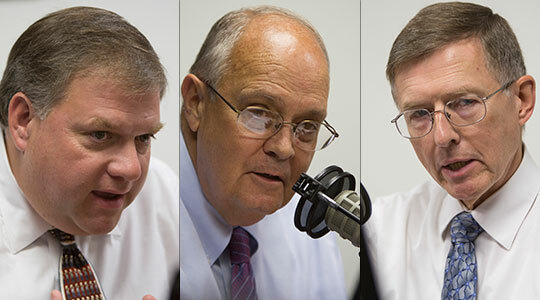 Deacons Steve Marcus and Don Philips also joined Scot and discussed how Massachusetts is seen by proponents as the key to pushing both a larger anti-life agenda and wider passage of such laws throughout the country. 1st segment: Scot Landry welcomed everyone to the show and said on Election Day, November 6, voters in Massachusetts will be asked to consider the ballot Question 2 on whether to legalize physician-assisted suicide. ORegon has already legalized the practice. Dr Ken Stevens is an oncologist in Oregon and he helped formed the Physicians for Compassionate Care Education Foundation. Scot emphasized that the organizers of this group represent many faiths, including Ken who is Mormon. Scot said Ken just addressed more than 50 leaders of the effort jun Massachusetts at an event at the Archdiocesan Pastoral Center. Deacon Don Philip met Dr. Stevens when he was working in healthcare in Portland, Oregon, in 1995 when assisted suicide was just getting going in that state. Deacon Steve Marcus operates nursing homes within the Commonwealth of Massachusetts as well as hospice centers and psychiatric facilities. Assisted suicide has been legal in Oregon since 1994. Scot asked Ken why it passed in Oregon. He said he’s been a cancer doctor for more than 40 years. When it came up in 1994, he didn’t think it would pass and when it did pass–51 percent to 49 percent– he was appalled. Patients no longer have a safe harbor to go to. He said since assisted suicide became operational in 1998, there have been over 600 death with more than 70 last year. He emphasized that this was not about scientific medical advances, but a drive by the Hemlock Society to legalize the practice. They were then successful in Washington and now they’re in Massachusetts because they think it’s possible to legalize it here. Ken said individuals approach his organization wanting to know whether their doctors will push them to suicide. One woman said her mother had a history of cancer, was admitted to a hospital and a doctor she didn’t know told her that her mother had pneumonia and asked if she wanted her to receive antibiotics. This was a roundabout way of giving the daughter the opportunity to have her mother die. Her response was that her mother was competent and that her mother should be asked and of course she wanted to have the antibiotics, which were not extraordinary measures to keep her alive, but ordinary treatment. He related another story of a woman who had a treatable form of cancer. She didn’t want treatment and wanted the pills to kill herself, saying she had voted for it. He went back and forth with her and finally asked her about her family and convinced her to take the treatment for them. She never required surgery, the treatment was relatively mild, and she is still alive twelve years later. Now she thanks him for saving her life. In fact, since then she’s been able to take care of her own mother who has suffered from dementia. Scot asked Dr. Stevens about the pronouncement by doctors that a patient has a particular amount of time left, since that is the crux of the proposed law. He noted that you can tell whether a patient is within a day or two of death, but beyond that it’s very common for a patient to live for years after a terminal illness. He related several stories of people given terminal diagnoses, including in cases of advanced malignant tumors with predictions of agonizing death within days. But when he got more tests it turned out to be a different kind of benign tumors and he is still alive today. Yet during those awful days he went through a lot of fear and he could have received suicide pills. Terminal is a very vague term. Scot said that even those people who think there should be a choice think this proposed law is flawed. One reason is that there isn’t a requirement for a psychological evaluation. Deacon Steve said depression is a disease that can truly be cured with proper medicine and therapy. They treat thousands of frail elders who suffer from depression at the end of their lives, yet this law could have horrific results. Deacon Don said medical institutions are faced with cost pressures all the time. He said in Oregon patients are being denied chemotherapy because of their prognosis, but are being offered assistance in dying in their denial letters. Ken said the pills are large capsules. You have to take 100 of them all at once. Even a healthy person would have trouble swallowing them so the capsules are emptied into a liquid solution. The problem is that it tastes very bitter and is foul tasting. Ken said that putting aside the euphemisms, this is a prescribed overdose of sleeping pills. Ken said the purpose of the legislation in Oregon is not to give the patients any right. The purpose is to give immunity to doctors prescribing fatal doses of medication. Once the doctor writes the prescription he doesn’t any further obligation. On the claim that this is a right to die, Ken said we are all going to die at some point. The proponents of assisted suicide twist the language and use language to pacify the voters and that they think they will respond to. The aim is to use passage in Massachusetts as a springboard for further expansion of assisted suicide. For one thing, they would like to require doctors who do not want to prescribe suicide pills to refer patients to doctors who will. Proponents acknowledge that they don’t include the “duty to refer” in the original measures because they know the bill wouldn’t pass, then once it’s passed they can push it through incrementally. 2nd segment: Ken said study of assisted suicide in the Netherlands show the impact on medical professionals, who report increased amounts of depression and displeasure for their careers. Dutch doctors have formed counseling groups to help one another deal with the emotional and psychological aspects of killing patients. Ken said the claim that this is about uncontrollable pain is a smokescreen. In Oregon, most who have killed themselves said it wasn’t about pain and suffering. We can treat pain adequately. Deacon Steve said assisted suicide ruins the sacredness of the relationship between patient and doctor. Deacon Don said insurance providers in Oregon have already denied care for those with terminal diagnoses. Ken told the story of his wife Shannon’s treatment for a malignant lymphoma 30 years ago. It spread throughput her body and in May 1982 when they went to their doctor to see what else can be done, he subtly suggested an overdose of pain medication and she was so distraught that her doctor had given up on her. She died a few days later, leaving Ken with six kids. When you legalize assisted suicide, the doctor has all the power in the relationship. He related more stories of how Oregon’s health plan guidelines wouldn’t cover the cost of treatment medication, but would cover palliative care that includes assisted suicide. She went to the media and said the state was telling her that they wouldn’t pay for her to live, but would pay for her to die. Ken said the few days he had with his wife after that last doctor visit were valuable. He remembers his wife going from room to room in their house and around the yard and appreciated the 18 years they’d had together. He said that assisted suicide in Oregon has resulted in the state being given a mixed grade on end of life care. There are more patients dying in pain than they did before legalizing assisted suicide. The states’s suicide rate is also very high, 140% higher than the national average. This was an increase since the legalization. Scot said proponents call themselves Compassionate Choices and Death with Dignity, but were previously called the Hemlock Society. He asked Ken what the leaders of this effort have said about their aims. Ken said they write their language for easy passage, but they want doctors to have a duty to refer, they want to do away with “burdensome” reporting requirements to the state, make assisted suicide available to those who are demented or not otherwise mentally competent, and make it possible to have a lethal injection for those who can’t take the pills which makes it then euthanasia. Steve said true compassion is what he sees in his own facilities where the nurses aides help a frail elder or a chaplain bringing someone a sense of peace. When he sees a patient thank someone for delivering them the proper care they need. These are the Jesus moments and this is true compassion. Scot said these aren’t Catholic arguments we’ve heard today, but one good Catholic argument is that being with someone suffering at the end of life is a new opportunity to be with someone and bring Christ to someone in a precious moment. Ken said Massachusetts needs to realize the reality of assisted suicide and we need to educate ourselves to what has happened in Oregon.